I arrived in Scottsdale on Saturday and attended "Low-A" and "High-A" games at Salt River Fields, home of both the Arizona Diamondbacks and the Colorado Rockies. The Giants' squads were playing Arizona, and many young Dominican Summer leaguers scattered the Low-A team while higher-end, but still young prospects played for High-A. The first baseball I witnessed was 2015 eighth-round pick Cory Taylor pitching for High-A, but more on that later. One of the many highlights over the weekend was a five-inning showcase of Tyler Beede, who is across the board regarded as a top-three prospect in the organization. The big news from the hard-throwing right-hander is that he has brought back the four-seam fastball that he featured so well in college at Vanderbilt. After being drafted in 2014, Beede removed the four-seamer from his arsenal and focused solely on a low-to-mid 90s two-seam with good sinking action. But on Monday in Mesa at the Chicago Cubs minor league facility, both players and coaches confirmed to me that Beede will be featuring the four-seam pitch in 2016. His outing (see video below) featured stellar command in and around the strike zone. The four-seam reached up to 96 mph but hovered near 93-94 most of the day. He struck out five in five frames and didn't allow a walk. If you've been following Beede closely since the 2014 draft, where he was selected 14th overall, you may have noticed after watching this most recent clip that he no longer reaches his glove up over his head during the wind-up. He utilized the technique at Vanderbilt and when he first arrived at Giants camp in August of 2014. But at least since this clip during the 2015 Futures Game, he's been beginning the wind-up near the letters and keeping them there until separating hands from glove. He starts even lower now. The above video now shows Beede starting the wind-up near his belt and bringing both hands up to almost his chin before reaching back and throwing the ball. As previously mentioned, the command was on point. Beede located his pitches especially well against right-handed hitters, keeping them off balance with his two main off-speed offerings: a low-80s changeup and a slider that waffles between 77 and 81 mph. Along with the four-seam and two-seam sinker, Beede also pockets a mid-to-high 80s cut fastball. His final line (5 IP, 7 H, 3 ER, 2 R, 0 BB, 5 K) indicates his progress and drive towards his main goal on the mound: competing in the strike zone. 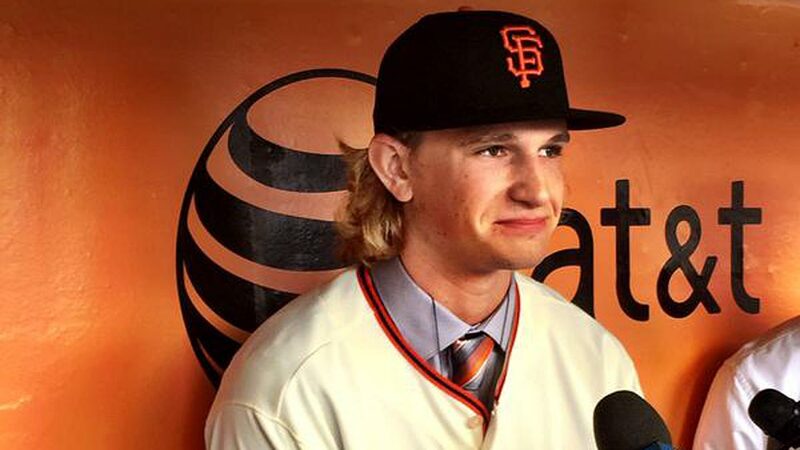 Though I thought Beede might return for the sixth inning, out trotted a lanky, newly-trimmed Phil Bickford. You might remember seeing this after the Southern California native was drafted 18th overall out of the College of Southern Nevada. Bickford, sans surfer hair, pounded fastball after fastball, both four and two-seam, at hitters throughout his three innings of work, sitting in the 90-to-93 mph range with both versions. He also featured a power curve (some may call it a slider) in the low-to-mid 80s and a low-80s changeup. Bickford was lights out in his debut year with the rookie-ball AZL Giants, owning a 0.851 WHIP to go along with 32 strikeouts in 21.1 innings. Facing Double-A-type players on Monday in Mesa, he allowed just two hits and one walk over three innings. Expect either an Augusta or San Jose roster placement once minor league teams are finalized. A possible teammate of Bickford this year may be 2015 second-round pick Andrew Suarez. But judging off his dominance of High-A players on Tuesday at Salt River Fields, and his limited but promising experience at the High-A level, Suarez could find himself on the Richmond Flying Squirrels at least by mid or late season. Though a small sample size, Suarez was called up from Salem-Keizer to San Jose in late August of 2015 and made things look easy. His four-inning, 64 game-score performance on August 20 at home against Bakersfield was marred with challenges considering shortstop Christian Arroyo's three-error debacle. The organization's top prospect made two throwing errors in the first inning and a fielding error in the fourth, yet Suarez didn't allow a run, earned or unearned, during the four frames. Before season's end, the University of Miami product had made two more starts to close out the year with a 1.80 ERA and an even 1.000 WHIP. On Tuesday, Suarez lasted five innings and struck out six. Four Diamondbacks' minor leaguers recorded hits and none received a free pass. The smooth-throwing lefty worked a very consistent 91-92 mph fastball and showed a potential plus slider in the mid-80s. He slowed it up with a high-70s curveball and also displayed another potential plus pitch — a low-to-mid 80s changeup. Pay special attention in the video below to one at-bat in particular (against a right-handed batter named Lugo) where Suarez shows him all four pitches, finishing him off with a back-foot slider. Suarez may have impressed me the most. He turns 24 in September, which leads me to think the Giants might move him through the system quicker if he continues to progress. More to come later on the topic of Spring Training viewings, including a potential reliever gem named Rodolfo Martinez, video of Cory Taylor, and interviews with Bickford and Jalen Miller.